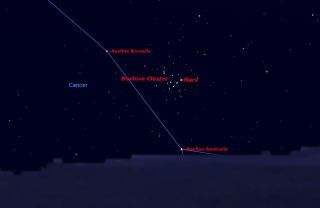 On Thursday morning, August 20, just before dawn, the planet Mars will pose in front of a swarm of stellar bees, the Beehive Cluster (Messier 44) in the constellation Cancer. Considering the thousands of stars in the sky, it is surprisingly rare to see a star in the same telescope field as one of the planets. The reason is that planets generally require a lot of magnification, and this severely limits the field of view of a telescope. On Thursday morning (Aug. 20), however, skygazers will get a special treat, when the planet Mars appears in the midst of hundreds of stars: the open star cluster known as the Beehive, Praesepe, or Messier 44. This star cluster is called "the Beehive" because of its resemblance to a swarm of the buzzing insects. It is also known as "Praesepe," which is Latin for "manger," because of its position between the stars Asellus Borealis and Asellus Australis, the northern and southern donkeys. Finally, it is number 44 in Charles Messier's famous catalog of deep sky objects. Located 590 light-years from the sun, the Beehive is one of the nearest and brightest star clusters in the sky. Its several hundred stars are concentrated in a volume 16 light-years across, and it actually outshines all of the individual stars in the constellation Cancer. You may be wondering where Mars is in the sky, because stargazers haven't heard much about it lately. That is because the planet has been on the far side of the sun in recent months, and impossible to see. It is only now emerging from the sun's glare and reappearing in the morning sky, just before dawn. Look for Mars around 5 a.m. local time this week low in the northeastern sky, and be sure to use binoculars if you want to see the Beehive behind the planet. Even in the smallest telescope, Mars should make a pretty picture lying in front of the many stars of the Beehive. But be sure to catch Mars Thursday or Friday morning (Aug. 21), because by Saturday the Red Planet will have passed the Beehive. Currently, Mars appears less than 4 arc seconds in diameter in the night sky. An arc second is a unit of measurement astronomers use to measure objects in the night sky. There are 60 arc seconds in 1 arc minute. Thefull moon, for instance, is about 1,800 arc seconds wide. This means that Mars won't be large enough to show much detail until mid-March next year. At that time, it will be heading toward its most favorable opposition in over a decade, which occurs in late May when the planet will reach 19 arc seconds in diameter. Editor's note: If you capture a good photo of Mars in the Beehive star cluster, or any other night-sky photo, and would like to share it with Space.com for a possible story or gallery, send images and comments in to: spacephotos@space.com.